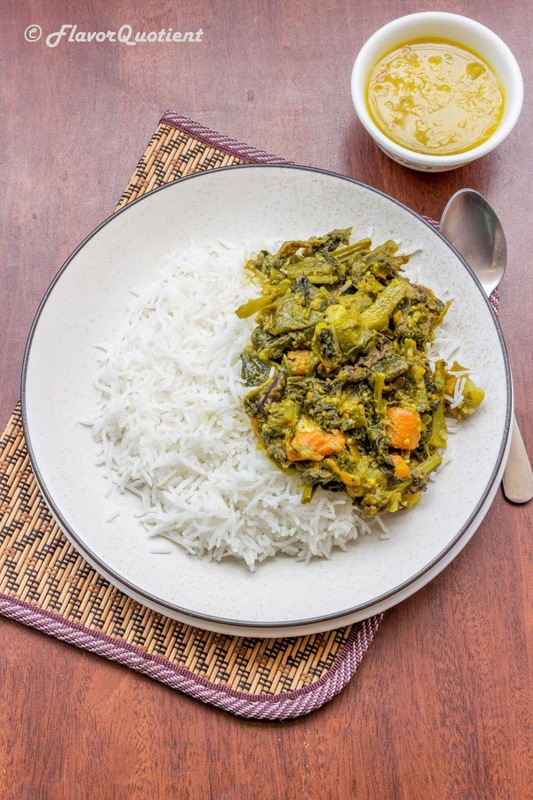 Ilish macher matha diye pui shaak which can be perfectly translated as Malabar spinach with Hilsa head – a typical recipe from Bengal, my hometown, which proves the extent of our love for fish! Today I bring to you a very authentic and very typical Bengali dish which most Bengalis freak about – Ilish macher matha diye pui shaak! 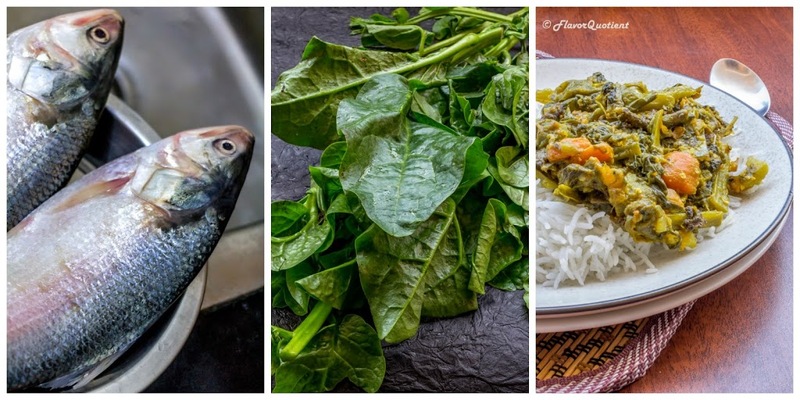 I can understand that the name may sound a bit weird to you, hence let me decode: Ilish macher matha is nothing but head of Hilsa fish and pui shaak is a variety of leafy greens belonging to the spinach family and is called Malabar Spinach in English. 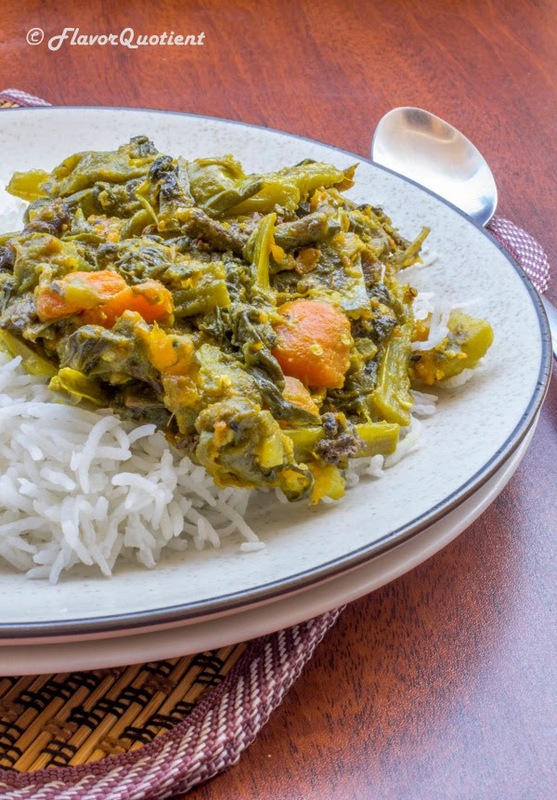 So, basically this recipe of Ilish macher matha diye pui shaak is a dry stir-fried dish, called as ‘chochhori’ in Bengali, with Malabar spinach i.e. our very own pui shaak and a medley of vegetables all combined together with the fried pieces of Hilsa head i.e. Ilish macher matha! Sounds queer? I can understand that typical regional recipes may sound little odd when you get to know about it for the very first time. I think that’s why the food blogs attract us so much; simply because we get to know about so many cuisines that exist across globe without travelling miles, each one having their own hidden gem. This Ilish macher matha diye pui shaak is nothing short of a gem of Bengali cuisine. We Bengalis can finish our entire meal with plate of plain rice and this immensely delicious Ilish macher matha diye pui shaak! Trust me! 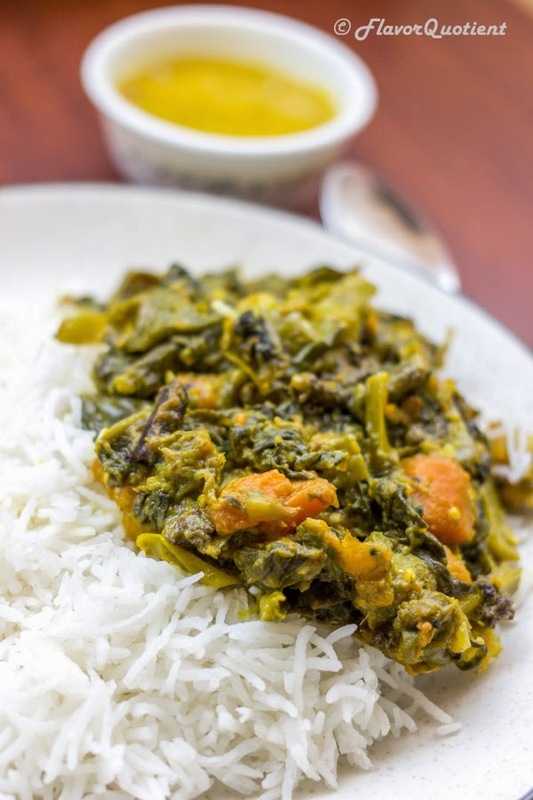 Malabar Spinach or pui shaak is something very common in any Bengali household and this particular recipe of Ilish macher matha diye pui shaak is my favorite simply because it involves my favorite fish ‘Hilsa’ (Indian Shad Fish). My hometown Bengal is in Eastern region of India and people from this place is specially identified with their eternal love for fish. I am no exception! Particularly, Ilish holds a special place in Bengali cuisine. Ilish is a fish full of flavorful fish oil which gives a distinctive flavor to this recipe of Ilish macher matha diye pui shaak and that mishmashed consistency of the chochhori with broken pieces of fried Ilish head is simply divine for us! Ilish fish has a much stronger pungency and yes, it is too full of bones which make the whole experience all the more exciting! I am having this Ilish macher matha diye pui shaak since my childhood and never thought this could go in my blog until my husband pointed it out – why not? This typical Bengali recipe of Ilish macher matha diye pui shaak could easily become a winner in the specialty cuisine from our region. It sure has all the potential and here is the recipe of Ilish macher matha diye pui shaak for you! Enjoy! Season the washed Hilsa head with salt and a pinch of turmeric powder. Now fry it in mustard oil till crisp and thoroughly cooked. Take it out in a plate and break into 3 to 4 pieces. Chop the Malabar spinach roughly. Slice thick stalks into two to help them cook evenly. Set aside. Heat 2 tablespoons of oil in a wok/kadhai. Fry the diced pumpkins, diced potatoes, diced ridge gourd and diced eggplant separately till golden brown. You do not need to fry them completely. Set them aside. Add the remaining oil in the same pan. Temper it with nigella seeds and green chili. Let them sizzle. Now add the chopped spinach and stir fry on high heat. Add half teaspoon of turmeric powder, sugar and salt to taste. Stir thoroughly. Now add the fried vegetables and mix well. Reduce the heat and cook covered. You may not need to add water as the spinach itself will leave a lot of water and get cooked in it. Once all the vegies are three-fourth done, add the pieces of fried Hilsa head. Stir thoroughly to mix well on high heat till all the water evaporates completely and it starts to stick at the bottom of the pan. The consistency of the final product will be kind of mushy with all the vegetables mashed and mixed with each other. Serve hot with plain white rice! This looks mighty flavourfull. Your rice looks perfect by the way. Any suggestions for substitutes on some of the less common items? Hi There! I am glad you liked it. If you are looking for a substitute of Malabar Spinach, you can replace it with fresh regular spinach as well. And if you are looking to substitute Hilsa, you can try American Shad fish. Hope this helps. Slurrp, slurrp. Really looking great. Khali dukhkho ekhanei j dekhei khushi thakte hobe. Keep cooking. Really! Even in Bangalore there is no Ilish supply this year.